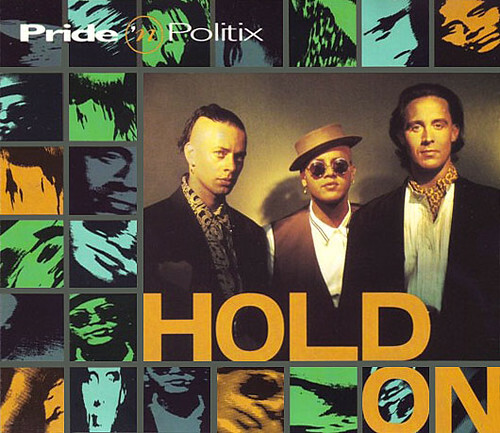 Pride 'n Politix were one of many bands of the time that looked like they had potential but were very quickly to sink without a trace. With the requisite number of white/not white band members, some reasonable singer/songwriter talent and a knack for aping the soul/acid jazz sound that was big at the time, they seemed poised for success in the 'States, but actually just released one single, one album and then broke up. 1. Uninspiring band name. What did "politix" have to do with their brand of slightly limp R&B? Was it something to do with the attention that apartheid was getting at the time? And "pride"? Presumable not gay pride. In any case, it was a terrible, terrible, awful name. 2. Image. OK, it was nearly twenty years ago, but Robin Smith - the guy on the right - looks like he's more likely to ask you to serve afternoon tea and dismiss the nanny than deliver a decent song. 3. The lyrics. Good grief. House/garage almost always has ridiculous lyrics, but Hold On was particularly nonsense. It's about love - obviously - and "the chains that bind us", with singer Nick Romillie telling his girl "Your touch is warm and exciting" ... "I want you so much / I can feel your spirit move me", which is probably the most convoluted euphemism for getting an erection I've ever heard in a song. Actually, the line "We've got to hold on to my love" could also be misinterpreted by someone with a filthy mind. Like me. Even with its bonkers bad lyrics, you have to admit the track is rather catchy, devilishly catchy in fact. Now that I've put the extended almost Red Zone-style dub section into the middle, it's pretty palatable stuff. Result! And where are they now? Well, Nick Romillie is still in the business, having quite a bit of success having reinvented himself as broken beat singer Colonel Red. And Robin Smith's website humbly says that he is "one of the most versatile and successful musicians in the world", which even if it were true would be hugely pretentious as an introduction. No doubt he would rather forget the crash 'n burn of Pride 'n Politix now that he's doing string arrangements for Enrique Iglesias. In fact he's so versatile and successful that he hasn't had time to update his site in the last five years, poor thing. Success is a cruel mistress indeed. P.S. Do you think the label EastWest has the track available for legal download? Or the album? Once again, no. Pfff. Just as i thought, 10/10 on the edit Jason! I'm really pleased with it too. Can't stop listening to it!